Recommended from November to April. Wildebeest Migration happen every year, the vast herds of wildebeest embark on a long-distance migration that coincide with the annual rain fall patterns and grass growth. Following the short rainy season in November, the herds of wildebeest arrive to the short-grass plains of the Serengeti around November. The short-grass plains are located in the area east and south of the Seronera, around Ndutu and the northern Ngorongoro Conservation area. Herds of wildebeest and zebra can be seen across these plains as they feed on the nutrient rich grasses. The majority of the wildebeest calve around February. They normally stay in the area till April and then start moving west towards to the Western Corridor of the Serengeti National Park. Our 6-day Migration wildlife safaris, tours, holidays and travel packages, have been designed specifically to focus on and to increase your chance to see the great Serengeti wildebeest migration. We have designed the itinerary to include the Lake Ndutu area, southern Serengeti and central Serengeti National Park where the majority of the wildebeest migration can normally be found from December through to April. To save on unnecessary travel time and to increase your game viewing time, this itinerary has been designed that you drive from the Serengeti National Park to Arusha town on the last day. The itinerary also include a visit to the world famous Ngorongoro Crater. Day 1: Arusha to Ngorongoro Crater. After breakfast you will be picked up from your hotel at Arusha and transfer to the Ngorongoro Conservation area. You will arrive in time for lunch at the lodge and after lunch you will descend over 600 meters into the crater to view wildlife for an afternoon safari tour. Supported by a year round water supply and fodder, the Ngorongoro National Park supports a vast variety of animals, which include herds of wildebeest, zebra, buffalo, eland, warthog, hippo, and giant African elephants. Another big draw card to this picturesque national park, is it’s dense population of predators, which include lions, hyenas, jackals, cheetahs and the ever-elusive leopard, which sometimes requires a trained eye to spot. You will visit Lake Magadi, a large but shallow alkaline lake in the south western corner, which is one of the main features of the crater. A large number of flamingos, hippos and other water birds can usually been seen here. Dinner and Overnight at allocated accommodation as requested. Day 2: Ngorongoro to Ndutu. After breakfast you will head to the Lake Ndutu area, situated in the Ngorongoro conservation area, part of the southern Serengeti Eco-system. Lake Ndutu is alkaline, like most of the other Rift lakes; however the water is still drinkable and used by a wide array of local wildlife. You will arrive in time for lunch at the lodge or camp, and after lunch you will do an afternoon game drive in the Ndutu area. The majority of the wildebeest migration can normally be found on the short-grass plains from December to April. The area is usually heavily populated with elephant, birds and resident game. Dinner and Overnight at allocated accommodation as requested. Day 3: Full Day Ndutu Game Drive. After early breakfast, enjoy a full day game drive in the Ndutu area. Explore the range of different habitats that include swamps, woodland, soda lakes and the world famous Serengeti short grass plains. See great herds of wildebeest and zebra. During a short time frame around February, normally lasting for about 3 weeks, the majority of the wildebeest calve. The sea of grass provides little cover and the young are easy pickings for a variety of predators. Wildebeest calves can run minutes after they are born and within 3 days they are normally strong enough to keep up with the herd. Day 4: Ndutu to Central Serengeti Plains. After breakfast you will head towards the central Serengeti National Park, also known as the Seronera. We descend into the heart of wild Africa – the Serengeti National Park – with its endless plains, rolling into the distance as far as the eye can see. We head to the Seronera area, one of the richest wildlife habitats in the park, featuring the Seronera River, which provides a valuable water source to this area and therefore attracts wildlife well representative of most of the Serengeti’s species. Arrive in time for lunch and enjoy an afternoon game drive in the Serengeti national park. Day 5: Full Day Central Serengeti Plains Game Drive. Be one of only a few fortunate people to glide in a Hot Air Balloon over the Serengeti Plains (available at supplementary cost by pre-arrangement as an option). Floating silently above the awakening bush, while spotting wildlife and enjoying the amazing scenery of Africa, across rivers and over numerous small villages. After breakfast enjoy a full day game drive in the Serengeti National Park. 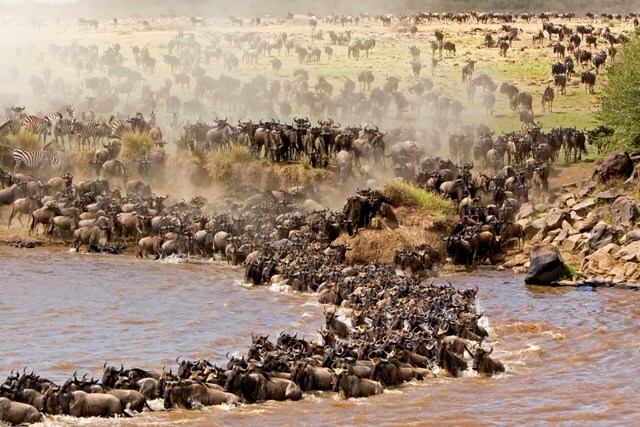 The majority of the wildebeest migration normally passes through the Seronera in late November to middle November, when they migrate from Kenya’s Masai Mara in north to the Ndutu area in the south. The migration then passes through this area again in April when they move west to the Western Corridor of the Serengeti National Park. The Seronera area is also an ideal starting to point to visit the eastern and southern short-grass plains of the Serengeti National Park. Day 6: Serengeti Plains to Arusha. After breakfast you will pack your staffs for the tour to depart from central Serengeti to Arusha to your hotel or Airport drop off.You will arrival at Arusha at a reasonable time in the afternoon.